Initially, MRSA infections in the skin resemble minor skin infections; they appear as a red bump, pimple, or boil on the skin that may be painful, swollen, or warm to the touch. Occasionally, these infections may open and have pus drain from the area. Although most MRSA skin infections are mild, some progress and spread further into the skin and to other areas or organ systems. Is It MRSA, a Spider Bite, or Something Different? Bug bites, insect bites, spider bites, rashes, and stings are often difficult to distinguish from MRSA infections because they have similar appearances or symptoms. 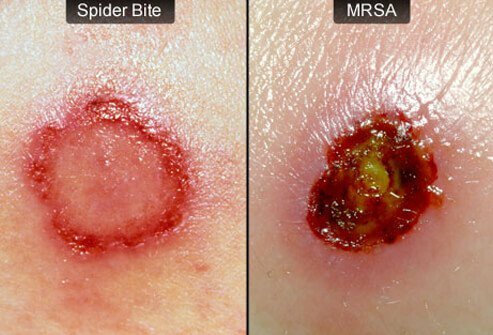 However, if the person never viewed a spider or other entity causing the lesion, there is a good chance the skin lesion may be caused by MRSA, especially if the lesion area spreads or does not start getting better after about two to three days of treatment with common antibiotics. Often, the first indication of MRSA infection is a spread of the infection into the surrounding skin, producing skin that is pink or reddish and often is warm, tender, and swollen. Such an infected skin area is termed cellulitis and represents infection spread into deeper skin layers. 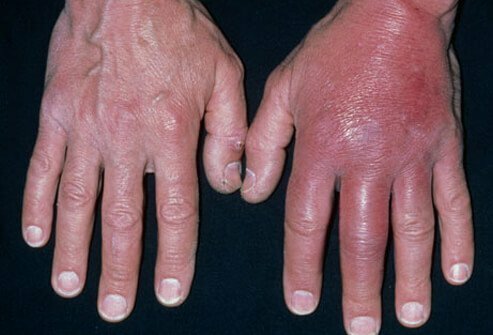 Cellulitis can rapidly advance (over a few hours) in some individuals. 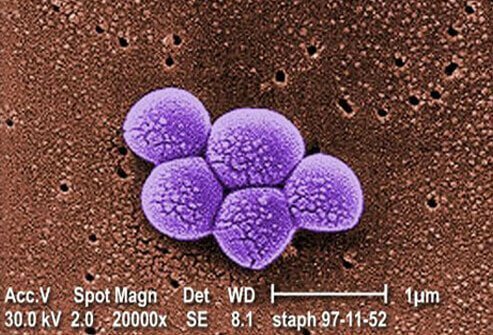 MRSA may be somewhat contained by the body by attempting to wall off the invading bacteria by making a pocket of pus surrounded by cells trying to kill or stop the MRSA from advancing. This deeper skin infection is termed an abscess and can spread like cellulitis in some instances. Abscesses usually require drainage (sometimes done with warm compresses, sometimes with a needle, while others require surgical drainage) and antibiotics; your doctor should be consulted as you should not attempt to treat MRSA infections by yourself. How Do People Catch MRSA? Some individuals are at higher risk to get MRSA than others. People who have a chronic medical condition (for example, cancer, HIV, or any immune depression), the elderly, individuals in hospitals, or those who have had recent surgery are at higher risk for MRSA infections. Hospitals used to have a reputation as an area to get MRSA infections. However, in recent years, with guidelines established and followed by hospital staff, visitors, and patients, there have been far fewer MRSA infections occurring in hospitals. 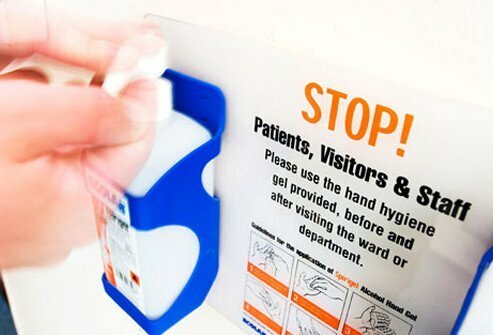 Simple changes in hygiene policies and utilization of more strict hand-washing procedures have made a positive impact in reducing MRSA infections in hospitals and other institutions like nursing homes and even in community areas such as athletic facilities. Can Healthy People Get MRSA? MRSA can easily infect healthy people. 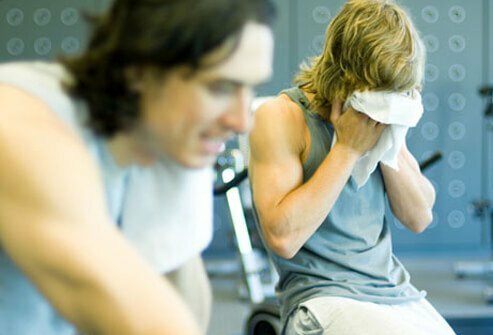 Outbreaks have been documented at many areas where people are crowded together (for example, gyms, dormitories, barracks, prisons, and day-care centers). The type of MRSA obtained by healthy people outside of health-care facilities is often termed community-associated or community-acquired MRSA (usually termed CA-MRSA) by many clinicians. 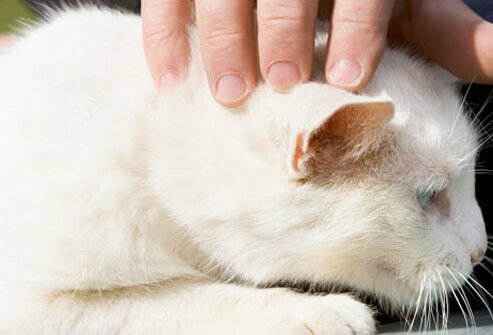 MRSA can be transferred to pets such as cat or dogs (the animals may have no symptoms like human MRSA carriers) and, unfortunately, may reinfect the pet owners or other people. Only CA-MRSA strains have been documented to do this with pets. MRSA strains survive fairly well for some time on objects handled or worn by carriers or infected individuals. 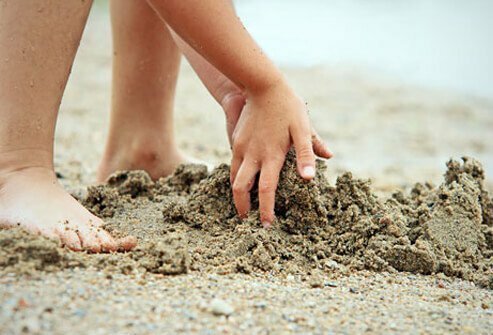 MRSA has been found even in sand and beach water on occasion. How MRSA arrived there is unclear, but the practice of good hygiene (covering skin scrapes, frequent hand washing, and showering with soap after going to the beach or engaging in another water activity) is the best way to reduce the chance of getting a MRSA infection from objects in the environment. Definitive diagnosis of MRSA is not difficult. 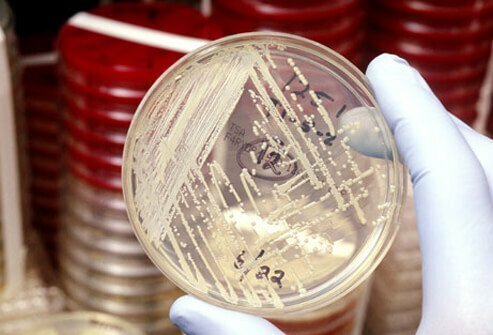 However, it may take a few days because, after S. aureus is cultured from an infected site, the bacteria then need to be tested against antibiotics to determine not only what the bacteria are resistant to but also what antibiotic(s) might be effective. A doctor should guide treatment of MRSA infections. Most treatment methods depend on the severity of the infection and the resistance pattern of the bacteria. Some minor sores or small abscesses may need only warm compresses for pus drainage (if present) and cleaning and coverage with a small bandage. 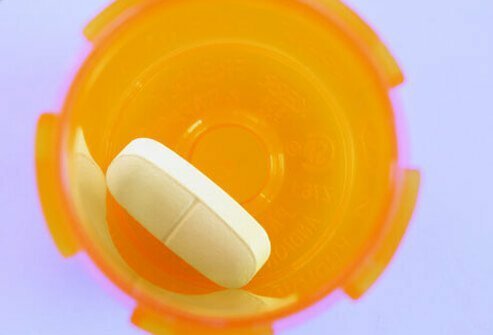 Many clinicians will prescribe an oral antibiotic that some MRSA are usually sensitive to (for example, sulfamethoxazole and trimethoprim [Bactrim], linezolid [Zyvox], or clindamycin [Cleocin T]). 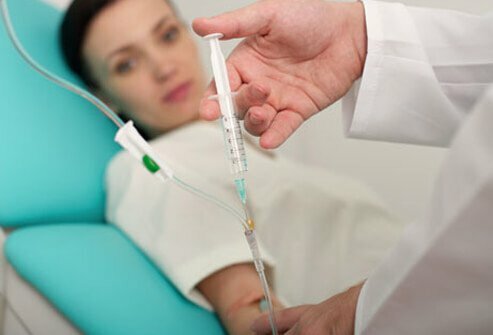 More invasive or severe infections might respond to oral antibiotics, but many clinicians may choose to treat such infections with IV drugs such as vancomycin (Vancocin), possibly along with a second IV antibiotic. Most severe infections are treated in consultation with an infectious disease specialist. If you are diagnosed with MRSA and sent home with antibiotics, you are strongly advised to take all of the antibiotics prescribed, even if you feel fine, to prevent the infection from reoccurring. Following your doctor's advice about warm compresses and wound care is also important to help you recover. In addition, you need to be careful to dispose of or disinfect items you contact to prevent passing MRSA to others. MRSA infections (especially those associated with health-care facilities) can be dangerous; they can spread rapidly to other body areas and organs and cause serious organ damage or death. 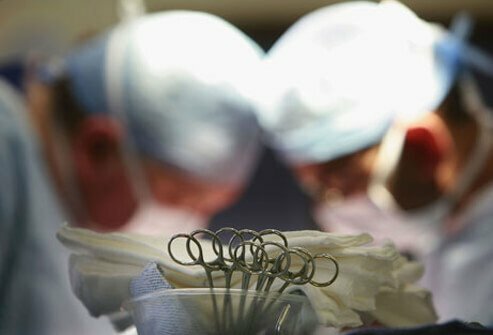 At their peak, reports indicated there were about 19,000 deaths in a year due to MRSA, but recently, this rate has decreased because of good hospital practices according to the CDC. Avoiding or reducing the chance of getting infected with a MRSA strain of S. aureus is fairly easy -- the cardinal rule is frequent hand washing with soap and water. Using an alcohol-containing hand sanitizer can also reduce infection risk. Avoid skin-to-skin contact with others if possible. Don't share towels and never touch bandages or wounds on other people, especially if they are hospitalized. Again, hand washing and showering with soap and water is the key to reducing MRSA (and other) infections. 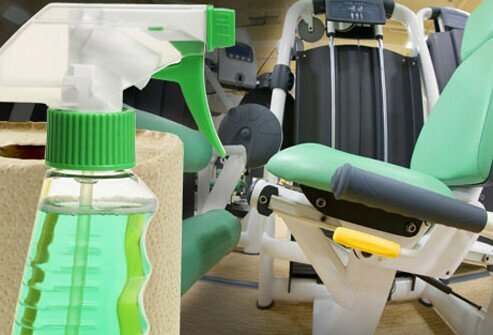 Disinfecting surfaces and other items also reduces the chances for infection. Dr. P. Marazzi/Photo Researchers Inc.
Centers for Disease Control and Prevention: "Cleaning & Disinfecting for MRSA"
Centers for Disease Control and Prevention: "Diagnosis and Testing of MRSA Infections"
Centers for Disease Control and Prevention: "Methicillin-resistant Staphylococcus aureus (MRSA) Infections"
Centers for Disease Control and Prevention: "MRSA Prevention"
Centers for Disease Control and Prevention: "MRSA Statistics"
Centers for Disease Control and Prevention: "MRSA Symptoms"
Centers for Disease Control and Prevention: "MRSA Treatment"
Centers for Disease Control and Prevention: "People at Risk of Acquiring MRSA Infections"